Today's card is slightly unusual in that it has a vertical greeting. Vertical Greetings and Touches of Texture. Vertical Greetings are a great way to get a wow on a card because they're just a little out of the ordinary. 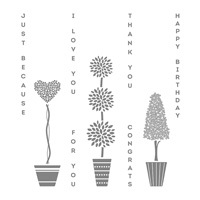 This Vertical Greeting Set is especially versatile with 6 different greetings to choose from. There are lots of ways to use a vertical greeting, including on a banner like Judy did on her card. Touches of Texture always add a special look to a project. Do you like the sweet flowers? Usually we think of texture as being splotches or swipes, but check out all the images in this set. It has the splotches and dots along with several different flowers, a bee and even a dragonfly! 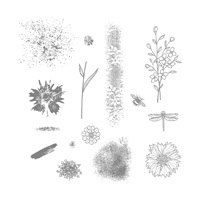 There's lots of great imagery in Touches of Texture and I can see myself using this stamp set a lot. Coloring is all the rage these days and the flowers Judy chose are an easy image to color. It adds so much to a project when you can coordinate colors of inks and papers. 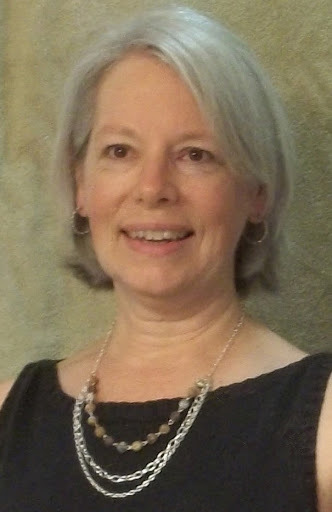 Judy used Stampin'UP! 's Sweet Sugarplum and Always Artichoke. Sweet Sugarplum is one of the the 2016-2018 In-Colors. You can buy the paper in individual color packs (24 sheets per package) or as an In-Color Assortment pack (4 each of the 5 colors). Marker or Blender Pen? What is your preferred coloring tool? Did you know that you can use re-inkers with Blender pens to color. When you're done you just wipe the blender pen clean and its ready for a new color. Blender pens and re-inkers . . . instead of markers . . . are a great way to stretch your hobby dollars.